GIOVANNI DARIO TO THE SPIRIT OF THE CITY. 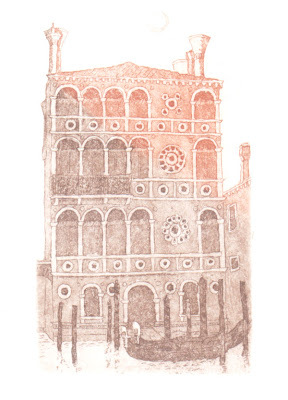 Dario was a Christian, too -- everyone in Venice was-- but more important, he was a Venetian citizen. This citizenship was a gift for his service. He had not been born to it, and he had dedicated his whole life to the service of quella cità santa -- his earlier, more personal expression of pria Veneziani poi Cristiani, or siamo Veneziani. First Venetians, then Christians. Few meant it with the particular intensity that Dario felt, and his letters from abroad yearn toward his Venice, and his bed in Venice, with all the yearning another man might have extended towards a beloved. Say, Sigismondo Malatesta for his Isotta. A brief article on Sigismondo's Tempio Malatestiano in Rimini discusses an excerpt from a Greek inscription on the exterior of the church: ΘΕΟΙ ΑΘΑΝΑΤΩΙ ΚΑΙ ΤΗΙ ΠΟΛΕΙ ΤΟΝ ΝΕΩΝ -- THIS TEMPLE TO THE DEATHLESS GOD AND THE CITY. The beginning of the inscription reads, SIGISMONDO PANDOLFO MALATESTA . . . HAS ERECTED. And this is where Cyriaco of Ancona comes in. Cyriaco came in often during the first half of the 15th century. He and Sigismondo Malatesta had met at the church council in Florence in 1439, if not before, but in 1432 Cyriaco had visited Naples and copied down a temple inscription in Greek he found there which read TIBERIUS JULIUS TARSUS TO THE DIOSCOURI AND THE CITY. Stay with me on this. In the late 1440s, Malatesta commissioned the dazzling Alberti to fix up a 13th-century Franciscan gothic church in Rimini. Alberti fixed it up, all right, baffling the Franciscans with a Renaissance reliquary full of elephants, pagan deities, and dancing cherubs to enshrine the bodies and the love of Malatesta and his brilliant wife Isotta. Piero della Francesca who was also at Florence in 1439 painted Malatesta's portrait in a fresco in the interior. Cyriaco visited Rimini in 1449 and that article on the Tempio suggests that Cyriaco gave Malatesta this Neapolitan inscription which was then adapted and carved on Alberti's confection. But Cyriaco surely did not change the Greek "temple" from the ordinary ΝΑΟΝ of the Naples inscription to the showy ΝΕΩΝ of Rimini. Malatesta had Greek scholars on staff, and it could have been done that way, but another person whom Malatesta had met at Florence in 1439, and one who chronically employed such hyper-classical Greek was Georgios Gemistos Plethon of Mistra. Malatesta admired him intensely, so intensely that when he was leading the Venetian war in Greece in the 1460s and briefly captured Mistra, he brought back Plethon's body as his personal souvenir and buried him in a sarcophagus on the exterior of the Tempio.